The North American debut of the DeBaer Saphir turntable with Reference power supply ($57,000) and DeBaer 9″ Onyx tonearm with VTA adjustment ($7000) and equally pricey Top Wing Suzaku (Red Sparrow) cartridge ($16,500) was the big news in a room that paired Rockport Technologies Cygnus loudspeakers ($62,500) and high-end Argento Audio FMR silver cabling with a full line of CH Precision electronics. Focusing solely on vinyl reproduction during my time in the room, we began with one of the most overplayed audiophile classical demo track, the Reference Recordings version of Rimsky-Korsakov’s unquestionably exciting but ultimately tedious Dance of the Tumblers. At least it was only the first time I’d heard it at AXPONA. The sound was far more toned down and mellow than I’m accustomed to hearing from CH Precision. It took more than a bit of volume for the sense of depth and realistic soundstaging to emerge, but once it did, it was impossible not to notice how good the bass was. Shirley Horn’s exquisite, close-miked “Softly, As I Leave You” was nicely detailed but a bit subdued. Most successful was Tommy Schneider & Friends’ “Ain’t No Sunshine” from their rare jazz album Plan b3. From CH Precision: L1 preamplifier ($34,500), P1 phono stage w/ EQ Filter Board ($32,850), X1 Dual Power Supply, and A1.5 mono amplifiers ($75,000/pair). 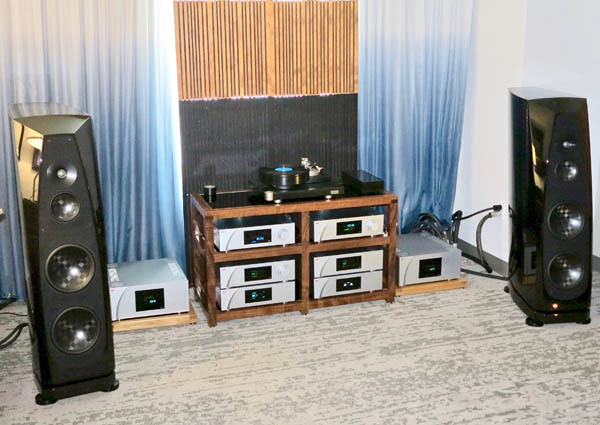 Unheard from CH: C1 DAC w/ USB & Clock Sync Boards ($36,500), D1 SACD & CD Drive w/Clock Sync Board ($39,500), and T1 Clock Generator w/GPS Board ($28,600). I didn’t hear the Auralic Aries G2 Streamer ($4000) either, but I did enjoy the Box Furniture Claro Walnut three-shelf double-wide rack and Box Furniture AL amp platform.